Kitty L. Kielland is inextricably linked with Jæren. Few others have depicted its distinctive scenery and atmosphere with such empathy. Since 1877 she had been spending her summers there. Its dark bogs which stretched inland and its sand dunes facing the sea provided her with subject-matter for the rest of her life. She was interested in painting "the grandeur of the landscape and the wealth of poverty", as she herself put it. 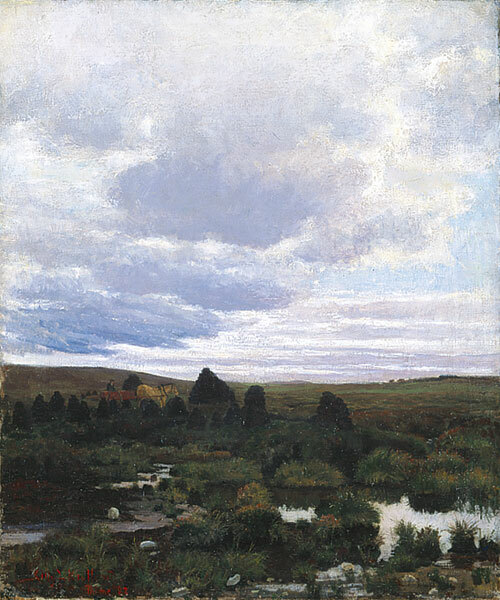 The first time she used the peat bogs as her subject was in a large painting which was exhibited at the Salon in Paris in 1880. The version we see here was painted at Time on Jæren during the summer of 1882. The way the paint is handled in broad, pastose brushstrokes shows the influence of contemporary French painting.